I regret that I am forced to paraphrase a quote from America’s founding that says in essence that the exercise of power is only limited by what is tolerated. It sounds like Jefferson of course, but might not be. One should copy such things immediately. I’ve spent enough time trying to find it again. Anyway, it’s consistent with the overall flavor of many quotes about overreaching power and resistance. What I want to point up is that the law is an agreement of a civil society. Just as its enforcers are not respected without the threat of penalty, they are not restrained without the threat of resistance. Somewhere there is a limit to what a population will tolerate. That limit may be reached more slowly in a society that is relatively well-fed, clothed, and housed. I have written about the duty of other officials sworn to The Constitution, like state government officials, to “nullify” federal laws thought unconstitutional; to say so and refuse to comply. Today’s legal consensus says that such a notion is anarchic and itself, unconstitutional. Now if so many supposed “pearls” of popular wisdom today are wrong, why in the world do you suppose that commonalities of today’s legal system might be any different? Might I suggest that the proliferation of lawyer jokes is no accident; that the “practice” of law is often a tool for the pursuit of an objective other than the truth? In this case, that objective would be to comport with the pop-culture notion that all power for effecting social policy stops at the federal government. I submit that the federal government was not only not intended to wield such power, it is in any case utterly incompetent to order a just and effective society. And I’m not saying that all defenses of this commonplace misunderstanding are disingenuous. Some fine people even of generally conservative sentiment, have imbibed this ubiquitous falsehood. In the past few days, I received a response to an email that apprised me that I was arguing with the country’s best lawyer in a particular field. Whatever. My devotion is to truth and goodness, not credentials and reputations. Also, one of the earliest assertions of the unconstitutionality of Obamacare, was Virginia Attorney General Ken Cuccinelli. I like him a lot and agree with him. But at the end of last year, I watched Ken Cuccinelli on Hardball with Chris Matthews, discussing his effort to pass a bill that would grant a majority of states a process to “repeal” legislation of the federal government. The statist Matthews who sees most everything in terms of politics more than principle, opined that they were only appealing to the southern secessionist/nullification crowd. Cuccinelli interrupted and disavowed nullification, describing it wrongly, and saying he was only trying to make a modest move back toward the original balance of federal and state power His proposal was modest indeed. But an “educated” lawyer like Cuccinelli conceded that any federal mandate is a legitimate exercise that must be fought in one of two ways. So, the duly contemporarily educated good conservative lawyer, Ken Cuccinelli may be in step with today’s legal consensus, but he is not in step with Thomas Jefferson and what he appeared to consider the intent of the American founders. 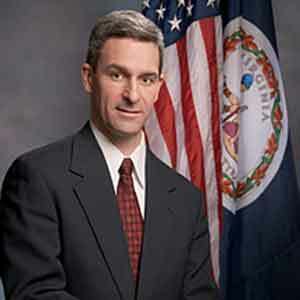 The usual first instinct of dismissal of nullification, is to appeal to “The Supremacy Clause,” which is most often summarized, “So, federal law trumps state law.” But, what the Supremacy Clause refers to is the primacy of the principles and the enumerated powers accorded the federal government in The Constitution, and Cuccinelli’s description of nullification as “when a state doesn’t like a federal law and folds its arms and refuses to play ball,” is entirely incorrect. Nullification of a federal law by a state (that again, is sworn to defend The Constitution) is saying precisely that the law is beyond the enumerated federal powers of The Constitution. It isn’t about what anyone “likes,” it’s about The Constitution. And I assure you, that the founders had nothing like today’s popular construal of The Supremacy Clause in mind. In discussion around The Constitution’s ratification, the whole point was to assure those who feared an over-assertive federal government, and that assurance was expressed in The Bill of Rights that culminated in the explicit assertion of The 10th Amendment: The powers not delegated to the United States by the Constitution, nor prohibited by it to the States, are reserved to the States respectively, or to the people. TexasGOPVote sent representatives to this past Saturday’s Nullify Now! Rally in Austin, which Bob Price Blogged live from. Here are a couple of excerpts from that. “Discussing new book on Nullification. His goal was to be able to explain nullification to his seven year old daughter. ‘When the government tries to do something not on the list of what it can do, we tell them they can't. She got it completely. Perhaps the Supreme Court should be made up of 7 year olds." "We are all tired of reacting to them (media, and law school academics). We will start doing things and make them react to us! That is Change You Can Believe In!"